Feel the merriment that the Fiat 500 has to offer when you invite it to become a part of your everyday life. This iconic and zippy subcompact car will put a smile on your face every time you see it in the driveway. Amuse yourself, and those around you, as you glide around Tyler, TX in your brand new Fiat 500. You’re going to see Tyler, Texas in a whole new way when you are riding in the Fiat 500. The iconic Italian flair that your Fiat 500 presents is unlike any other vehicle on the road. The Fiat 500 is hip and perfect for city travels but it can also take on country roads just as smoothly. You’ll definitely see your commute in a new light when you are in the driver’s seat of this Fiat. The Fiat 500 is truly a technological stand out with many innovate features that are before it’s time. The central intelligence system of the Fiat 500 is a Uconnect infotainment display which provides navigation information, music playlists, texts and so much more. You’ll also receive real-time information as well as full-color graphics images on the Uconnect, an added unique feature of the Fiat 500. Your next voyage is calling to you and you should embrace it with the new Fiat 500. Set the cruise control and let your mind relax as you take in the scenery around you. Seven airbags throughout the cabin will also ease your mind as embark on the curves and swerves off the road. The addition of a luxurious performance-designed interior only adds to the sweetness of this subcompact. 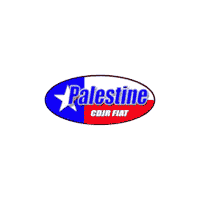 Palestine Chrysler Dodge Jeep Ram Fiat is the place to go if you’re shopping for a new Fiat near Tyler, TX. Our team has all the knowledge needed so feel free to pick their brains with any questions you have about the Fiat 500. Once your questions are answered, you can count on our sales professional to continue the conversation giving you any required information. Our team is here to give you the absolute best Fiat 500 shopping adventure around! We know that you’re going to have a great time cruising around Tyler, TX in your brand-new Fiat 500. And the dealership to work with on purchasing your Fiat 500 is Palestine Chrysler Dodge Jeep Ram Fiat. Our team is here to make sure you get exactly what you want at a price that is in line with your budget. It brings us great joy to be able to present you with an enjoyable and efficient vehicle buying experience and we promise to give you the highest level of customer service. We look forward to seeing all of our friends from Tyler, TX in the showroom soon. Life gets busy. Do you ever take time out for the simpler things in life? Now that you have the Fiat 500 of your dreams, it’s time to stop and smell the roses. 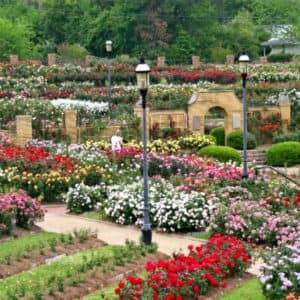 At the Tyler Rose Garden, that is. Choose the convertible 500 and smell the aroma that awaits you as you pull into this amazingly gorgeous garden with vibrant colors as far as the eye can see. Imagine the view or indulge in some photography when you visit this peaceful venue today.